Born 1995 in Novosibirsk. In 2013, graduated from the Music College at the M.I.Glinka Novosibirsk State Conservatory (class of professor Tamara Ignoyan, Distinguished Artist of the Republic of Uzbekistan). Currently, a student at Novosibirsk Conservatory in the class led by the same instructor. 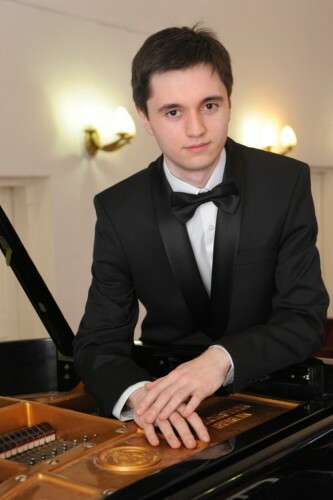 2011 - Award-winner of the Open Regional Contest of Chamber Instrumental and Piano Ensembles (Novosibirsk). 2011 - Recipient of the Gold Medal of the “Siberia’s Young Talents” Second Youth Delphian Team Contest of the regions within the Russian Federation’s Siberian Federal District (Novosibirsk). 2011 - Recepient of the Bronze Medal of the 12th Russian Delphian Games (Novosibirsk). 2014 - Winner of the 2nd prize of the 6th International Vera Lotar-Shevchenko Memorial Pianist Contest (Yekaterinburg). 2016 – 1st prize of the 3rd International Chopin piano competition (Tomsk). Took part in master classes by Michael O’Rourke, Konstantin Scherbakov, Elena Kuznetsova, Carlo Levi Minzi, Yuriy Bogdanov, Valeriy Shkarupa, Tanel Yoamest and Yekaterina Mechetina. Novosibirsk Oblast Governor Scholarship fellow. Recipient of the Presidential Talented Youth Support Award, “Siberian Asset” Non-governmental Inter-regional Prize and Denis Matsuyev Encouragement Scholarship. НУ "Центар за култура - Битола"